Pustular psoriasis is one of several types of psoriasis. It causes parts of the skin to redden, swell and become covered by tender, pus-filled blisters that are called pustules. The pus inside pustules is a noninfectious, whitish fluid. It contains lymph fluid, white blood cells and other cells that the body typically sends to places where there's inflammation. There are several subtypes of pustular psoriasis. It may be confined to small areas of the body — often, just the palms of the hands, the soles of the feet, or the fingers and/or toes are affected in what is called the focal form of the disease. The condition can cover larger areas of the body as well. The generalized form (von Zumbusch psoriasis) is much more serious, and this form can even be fatal. Sometimes pustular psoriasis occurs as a reaction to the use of topical treatments (tar and anthralin) for other forms of psoriasis. It also can occur as a reaction to the use of other medications, including lithium, indomethacin (a prescription pain killer), and high blood pressure medications such as propranolol. Stopping the use of steroids (either oral or topical) can also kick off an episode of pustular psoriasis. Being pregnant is an additional risk factor. There are several different types of pustular psoriasis. In this form of pustular psoriasis, pustules develop deep in the tissue of middle sections of the palm and instep. The pustules then migrate to the surface of the skin, where they darken and turn deep brown. The surface of the pustules is thick and scaly, and it will not break open. The area around the pustule is smooth, pink, and very sore to the touch. Pustules on the soles of the feet make walking very difficult and painful. 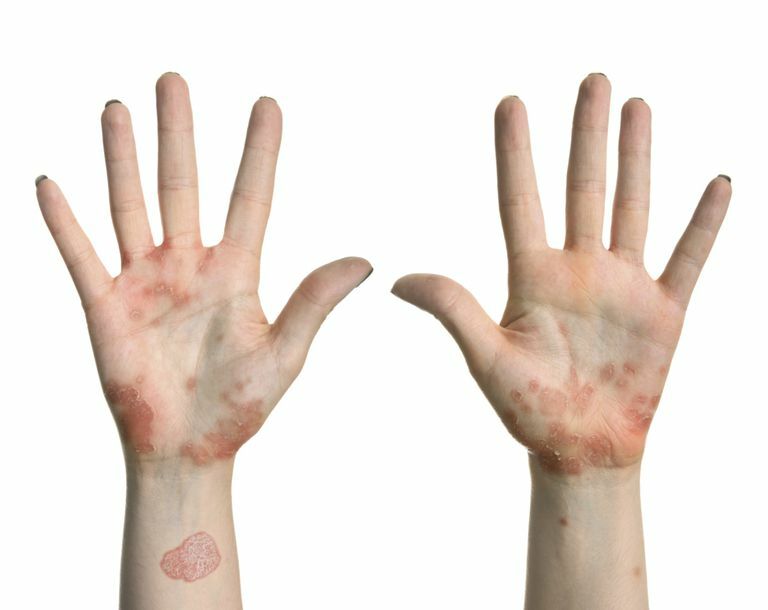 Pustules on the palms of the hands also greatly interfere with normal functioning. Pustular psoriasis comes and goes in episodes over the years. There are times when the condition almost disappears, only to be followed by very painful flare-ups. Smokers have a greatly increased risk for this condition. Treatment may involve medications such as acitretin, cyclosporine, and methotrexate. Another option is psoralen ultraviolet light A (PUVA), a combination therapy in which the drug psoralen is taken orally or applied topically and the affected skin is then exposed to ultraviolet light. Steroid creams or ointments may also be applied. The affected areas then are covered with air- and water-resistant plastic bandages, which increases absorption of the steroid into the tissues. This type of pustular psoriasis, known by doctors as acrodermatitis continua, often affects only a single finger or toe. Pustules appear at the end of that digit, often in an area that has been previously injured or infected. The pustules burst easily, leaving a very sore, ulcerated, cracked area that constantly leaks fluid. A scabby crust forms over the surface of the sore but regularly drops off, restarting the cycle. The nails of fingers or toes may be affected and deformed, and the affected digit is very painful, interfering with the functioning of the hand or foot. Treatment may include topical steroids and air- and water-resistant bandages, plus oral medications such as acitretin, cyclosporine or methotrexate. Unfortunately, though, this type of psoriasis is often resistant to treatment. This form of pustular psoriasis begins with reddening of the skin and the appearance of tiny, pinpoint-sized pustules. Over time, the pustules grow, spread and blend together into large bodies. The pustules are relatively fragile and easily broken, which introduces the dangerous potential of a bacterial infection setting in. The condition also affects the mucous membranes, so lip scales and oral ulcers are common. Other body-wide symptoms may occur, including fever, chills, weight loss, anemia, dehydration, fast heart rate, itching, and severe fatigue. More severe complications may include breathing difficulties, low blood calcium levels, pneumonia, congestive heart failure, and hepatitis. When you have symptoms of generalized pustular psoriasis, it's critical to seek immediate care from a dermatologist. Generalized pustular psoriasis is treated by placing dressings soaked in what's called Burow's or Domeboro solution — a mixture of aluminum acetate and water — over the affected areas. Topical steroids may also be used. Severe cases may require acitretin, methotrexate, or cyclosporine. Ferri F.F. "Psoriasis." Ferri's Clinical Advisor 2008. First ed. Ed. Fred Ferri. Philadelphia: Mosby Elsevier, 2008. 374-5. Habif T.P. Clinical Dermatology. Fourth ed. St. Louis: Mosby, 2004. "Questions and Answers About Psoriasis." National Institute for Arthritis and Musculoskeletal and Skin Diseases. May 2003. National Institutes for Health. "Pustular Psoriasis." Psoriasis.org. Dec. 2005. National Psoriasis Foundation.